The architectural appeal of cast-in-place concrete construction is widely recognized. In fact, structures with other framing systems often imitate cast-in-place concrete parapets and fascia. 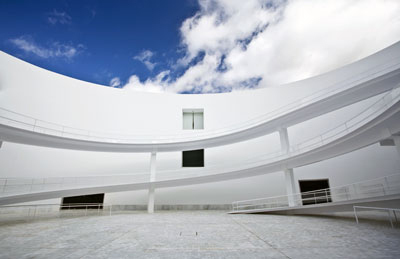 Curvilinear shapes and forms economically achievable in cast-in-place structures provide the necessary flexibility for creative architectural expressions. The ease with which architectural treatments of exposed concrete are achieved is a definite advantage of cast-in-place concrete structures. Analyses and competitive bids against alternative systems often show that post-tensioned structural systems provide initial cost savings. Plus, life-cycle costs often show savings for post-tensioned alternatives. Properly constructed cast-in-place post­-tensioned concrete floors are virtually crack free and use widely-spaced floor joints of 200 feet or more. The use of epoxy-coated reinforcement, encapsulation of post-tensioned reinforcement, low water/cement ratio air-entrained concrete, and concrete sealers in aggressive environments provide floor systems with minimal maintenance costs. Precast floors on the other hand, particularly “untopped” precast floors, require periodic maintenance repairs of the caulked joints between the precast units, resulting in higher maintenance costs and loss of parking spaces and revenue during maintenance work. In addition to eliminating caulked joints, post-tensioning helps achieve water tightness by introducing a state of bi-axial compression in the slab, thereby controlling cracks. This is an important advantage because water, dirt and de-ice chemicals leaking through cracks or joints may make parts of a parking structure unusable or require costly repairs. Cast-in-place, post-tensioned concrete construction provides long, column-free spans and is easily adaptable to the framing and functional requirements of parking structures. Post-tensioned construction easily accommodates the framing requirements of straight ramps, curved ramps, and irregular sites. There is no functional compromise as with other framing systems. Use of post-tensioning reduces the depth of the floor system by one third or more in comparison to some alternative systems. 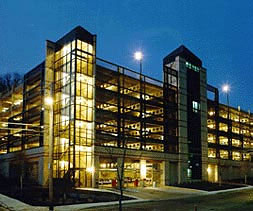 Reduced structural depth enhances both the appearance and economy of post-tensioned concrete parking structures. In some cases, depth reduction is an essential factor in meeting code height restrictions. For underground parking structures, reduced depth reduces excavation and shoring costs, as well as improving parking efficiency due to shorter ramps. Because of their draped configuration, the tendons in a post-tensioned structure carry much of the load directly to the columns. This reduces flexural deflections in the framing system. Due to post-tensioning, the entire concrete section is effective in resisting load effects. In conjunction with the redundancy of monolithic concrete framing systems, this reduces vibration of the completed structure. The wide beam spacing and flat surfaces provided by cast-in-place parking structures enhance the installation and efficiency of the lighting system. This results in improved aesthetics and enhanced patron security. The fire-resistant characteristics of the flat surfaces and wide beams of post-tensioned structures provide fire-resistance ratings to meet code requirements. Concrete insulation delays the strength loss of the main reinforcement. Thin-stemmed structural elements provide less concrete insulation, resulting in shorter fire-resistant periods. Properly designed and detailed, cast-in-place post-tension concrete parking structures are virtually crack-free, maintenance free, and offer great aesthetic freedom and flexibility for today’s architectural designs.